Bernice A. Bennett, B.S. , MPH. Bernice A. Bennett is widely known as the host of her own Blog Talk Radio show - Research at the National Archives and Beyond, a unique program devoted to presenting those who research and tell the African American family story. She is a family historian researching and documenting her own African American roots in the Orleans, St. Helena and Livingston Parishes of Louisiana, and Edgefield and Greenwood Counties of South Carolina. 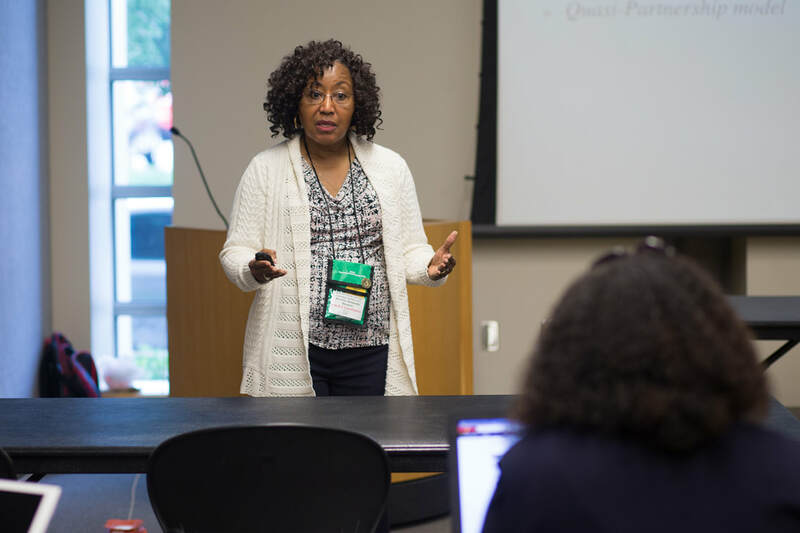 She has presented her research at the Afro-American Historical and Genealogical Association; ﻿South Carolina Genealogy Society Summer Workshop; ﻿National Genealogical Society﻿, the International Black Genealogy Summit and, the Washington DC Family History Center. 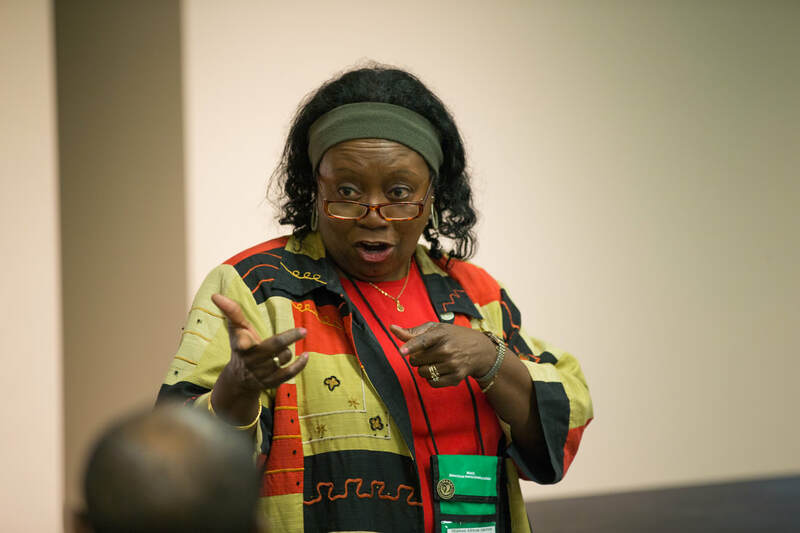 Bringing together her over 35 years of experience in community health, Bernice A, Bennett has embraced her love of teaching, facilitation, training, Association management, research and public speaking into helping others search for their roots. She is the President and Founder of BB’s Genealogy Research and Educational Services, LLC. Bennett has volunteered at the Washington, DC Family History Center for several years and has coordinated the African American Special Interest Group. She currently serves as a Citizen’s Archivist at the National Archives in Washington, DC where she is preparing the Civil War Widows Pension Records for preservation and digitization. Bennett received her BS degree from Grambling State University in Education and her Master’s of Public Health degree from the University of Michigan in Community Health. She holds membership in several national and local genealogical societies and the National Institute of Genealogical Research Alumni Association (now known as the Genealogical Institute on Federal Records (GenFed). Janis Minor Forté B.A. M.A. Janis Minor Forté is a genealogist, writer and lecturer who has received awards and citations for her research achievements. She is a member of several societies, including the Association of Professional Genealogists (APG), the ﻿National Genealogical Society (NGS)﻿, the International Society of Family History Writers and Editors (ISFHWE), the Illinois State Genealogical Society (ISGS), the Afro-American Historical and Genealogical Society, (AAHGS), the Afro-American Genealogical and Historical Society of Chicago (AAGHSC) and others. She is also a member of the Midwest African American Genealogy Institute (MAAGI) Planning Committee and one of its Track Coordinators. Ms. Forté presents workshops and lectures to large and small groups. Most recently she spoke at the 2nd International Black Genealogy Summit (IBGS) in Salt Lake City. Her presentation specialties include methodology, skill building techniques and case studies. She is skilled in on-site and on-line African-American research. Ms. Forte recently authored the article “Oral History? Prove It!”, which was published in Family Chronicle magazine. Her articles have also been published in the Illinois State Genealogical Society Journal, The Tennessee State Genealogical Magazine, and Missouri State Genealogical Association Journal, the Chicago State Society Quartely, and many more. The granddaughter of a slave, Janis Minor Forté, has been researching the history of her family since the late 1970s. Using a compilation of traditional and non-traditional sources, she has successfully traced her maternal ancestors to 1754; and her paternal ancestors to 1810 and has documented one line of her family to the African Island of Madagascar. In 2007, Janis’ research received certification by the Tennessee Genealogical Society for documentation of three of her maternal ancestor’s residency in the state prior to 1840. In 2009 – 2011, she chaired the publication committee of the Chicago based AAGHSC’s book, “30th Anniversary Our Heritage Family Stories”. This 386 page hard cover book is a fully indexed compilation of African American genealogies, family stories, pedigree charts and family group sheets. It is shelved in many county and state libraries, major genealogy libraries and archives and the Library of Congress. This book has been digitized by the Family History Library of the LDS and is now searchable online. Shelley Murphy B.S., M.A, D.M. Dr. Shelley Murphy, aka “familytreegirl”, is a native of Michigan residing in Central Virginia, a daughter to Calvin and Verna (Worden) Murphy, a proud mother of two adult children and a sister to four brothers. Dr. Murphy has been an avid genealogist for nearly 25 years researching the Davis, Marsh, Goens/Goins/Goings, Roper, Boyer, Worden, Cureton, and Murphy family lines. She holds a Masters in Organizational Management, an is an adjunct professor for Averett University. She presents Genealogy 101 workshops at the local community college, state and national genealogy conferences. Murphy is known for her inspiring and interactive “Getting Started” Methods and Strategies for genealogy research, “Time and File management” along with interesting problem-solving methodology lectures. Shelley currently has 20+ publications with Charlottesville Genealogy Examiner and the Central Virginia Heritage, a publication of the Central Virginia Genealogical Association. An avid genealogist for over 30+ years Dr. Murphy, aka, “familytreegirl” presents genealogy workshops at local, state & national genealogy conferences. She holds membership in AAHGS NGS, APG, DAR, and local genealogy groups. Murphy, is known for her inspiring & interactive "SO WHAT" analysis and Timelines for genealogical research. In addition, she presents interesting problem-solving methodology techniques. 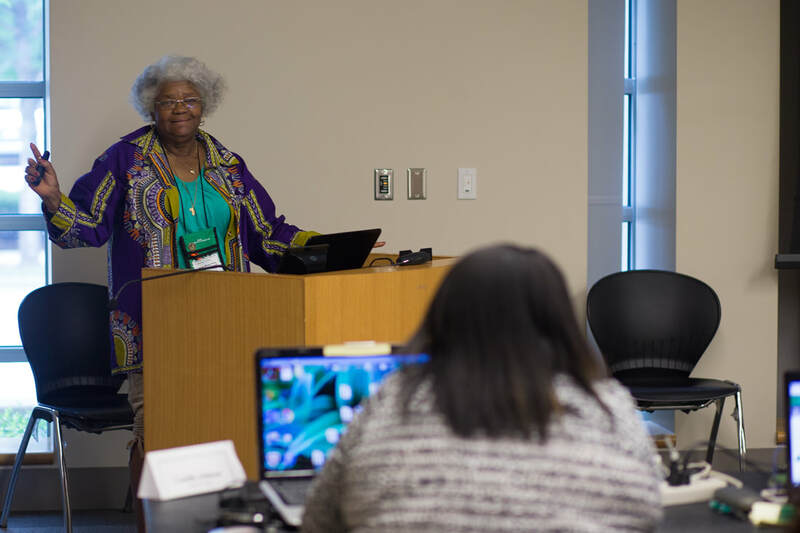 Murphy is also a coordinator and instructor at the Midwest African American Genealogy Institute (MAAGI) and serves on the Boards of the Library of Virginia,Albemarle Charlottesville and Fluvanna Historical Societies in Virginia. 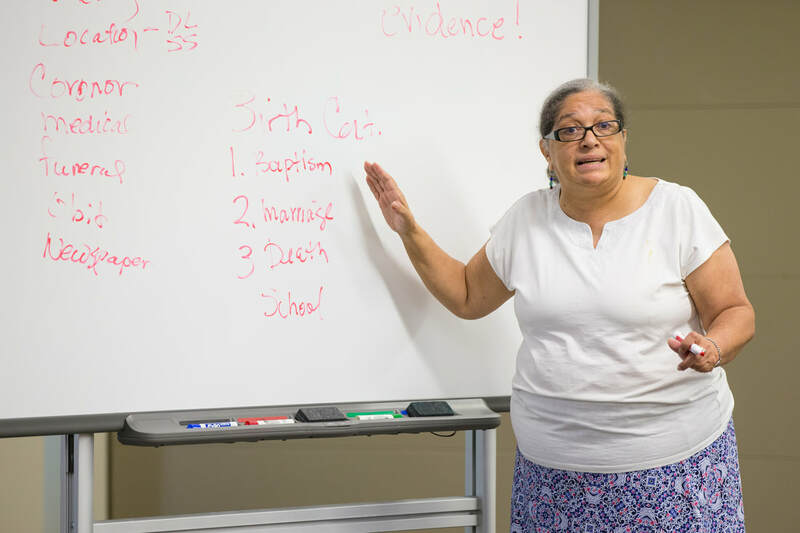 Angela Walton-Raji is known nationally for her research and work on Oklahoma Native American records. Her book Black Indian Genealogy Research, African Ancestors Among the Five Civilized Tribes, is the only book of its kind focusing on the unique record sets pertaining to the Oklahoma Freedmen. 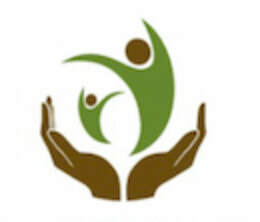 A founding member of the well known AfriGeneas.com, webite, Ms. Walton-Raji is also a genealogist specializing in information for beginners, via daily and weekly online genealogy chats on AfriGeneas.com. She also serves as the host of a weekly genealogy podcast, The African Roots Podcast a number of instructional videos and has been used in recent years as a genealogical consultant on several video documentaries. Ms. Walton-Raji combines her skills as a genealogist with a warm on camera personality that brings comfort to her viewers through and her video channels on YouTube, while providing her viewers with useful information. Her ﻿﻿African Roots TV﻿﻿, and Beginning Genealogist channels have both brought new insights to hundreds of viewers nationwide. Ms. Walton-Raji’s talents have been recognized by the Smithsonian Institution in Washington DC, for over a decade. In the 1990s she was a featured speaker at a number of Smithsonian events, and to date, she is the only genealogist in the nation, to present regular genealogy lectures at the National Museum of the American Indian, in both the Washington DC and New York facilities. She was a awarded the honor of presenting a special series of genealogy lectures to coincide with the Exhibition IndiVisible that officially launched in November 2009, and is now traveling throughout the nation. Beyond her public appearances, she is a published author, host of 3 blogs a 10 year ongoing message board, 3 websites, and she hosts the only weekly podcast devoted to African American genealogy. Her comfort with language and skills in writing, make her well known and well respected in the genealogy community. In the Spring of 2010, she was featured in a in-depth interview with the Smithsonian magazine online. She is an alumnus of the National Institute of Genealogical Research (now known as the Genealogical Institute on Federal Records (GenFed), she has taught in the Samford Institute of Genealogical Research and has spoken at Roots Tech, and has been active for many years in the African American Genealogical & Historical Society, where she now serves on the board of the Technology Education Committee. She holds a Bachelor's degree in Romance Languages and a Master of Education. She lives in MD where she continues to research, write and teach.